It’s Friday afternoon, so here’s an excuse to look like you’re thinking hard. But it needs a better caption than anyone else has come up with. Your task, folks, is to provide that caption. And to make it look like you’re working hard whilst doing it. 9 Responses to Birdie Caption Contest! Somehow that annoying song with the screechy “Eeeeeeeevrrrrrrybodeeeee dance now!!!!!!! !” lyrics is running through my head. That wasn’t a caption suggestion, just a fact. Do NOT press play on the video Eva embedded. You do not want your neurons to start a revolution. Seriously, it’s not worth it – just look at Richard. Scientists uncover new dinosaur mystery: just why were shadow and lighting levels so screwed up in the Cretaceous? but its a bit close to Cath’s. 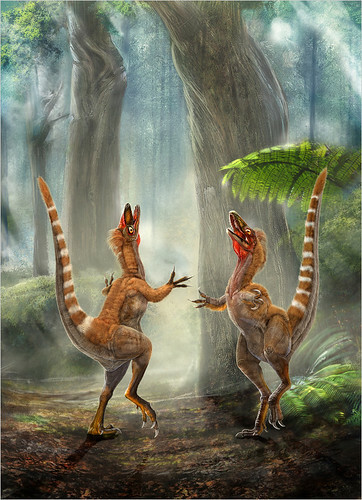 I was thinking of “if we stand like this for long enough, we can confuse the hell out of those paleontologists”.